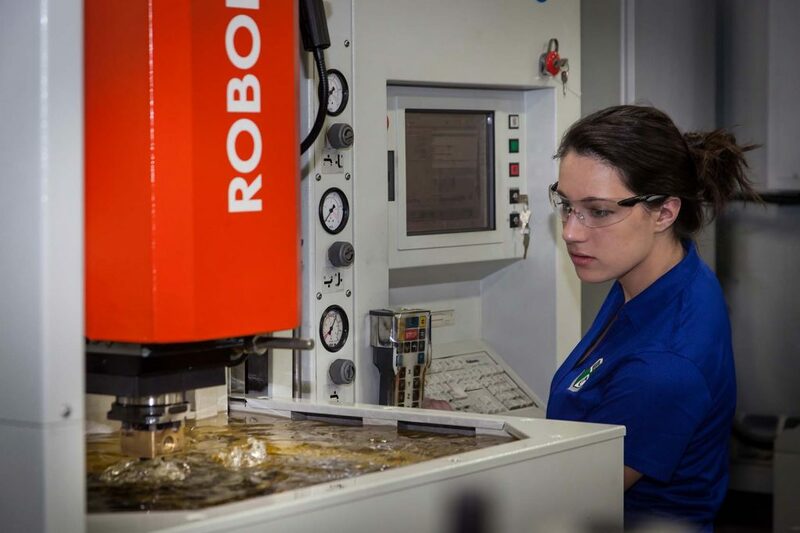 The Untapped Talent Pool: Equal Pay for Women in Manufacturing - Westminster Tool Inc.
Danielle leads our EDM Sinker department at age 22. In honor of National Equal Pay Day, it’s critical to bring awareness not only to the national statistics, but ways in which our company can support equal opportunity and equal pay. It is widely reported that women are often underrepresented in industrial jobs, and in many, are payed far less than their male coworkers. In honor of National Equal Pay Day, it’s critical to bring awareness not only to the national statistics, but ways in which our company can support equal opportunity and equal pay. In the tool and die making industry alone, women make less than half of men on average, earning an average salary of $25,063 compared to $55,281 for men. Further, women reportedly only account for 3% of the tool and die making occupation. Equal pay in manufacturing goes beyond compensating employees fairly. With women largely underrepresented in the field, we have to ask ourselves how to get more women interested in these positions. “Women represent manufacturing’s largest pool of untapped talent,” the Catalyst Research report says. With a growing emphasis on bridging the manufacturing skills gap, it’s critical for us to look at ways to attract more people from this talent pool. It’s smart business. Companies claim it’s hard to find female talent for STEM positions, largely due to a lack of female applicants. Compensation being a major component for attracting new talent, a perception of wage discrepancy will certainly deter women from entering the workforce. At Westminster Tool, our company culture is a huge component of how we succeed and separates us from our competitors. That’s why advocating for a more talented, more diverse workforce is part of our foundation. By motivating and supporting the existing women on your team, you lead by example, giving your company an employee who is more likely to inspire and advocate for more women. It starts with making these jobs more appealing to women by supporting equal pay and equal opportunity. Here are a few resources to help companies get more info and start thinking about ways to close the wage and skills gap.